The Way I Am: Femisism, Comic books, and percieved images. Very good point, about the homogenizing of female identity. Hear hear! Seems to me it isn't a shocking concept that there are loads of different types of women out there, but when it comes down to the wire, the generalizations rear their ugly heads. Shock and awe, women aren't all the same if their feminists, shock and awe, women want a decently sized female identity spectrum in our media! Now I want to go watch Mary Poppins. It seems like it is just easier for some ppl to believe that feminism is not something that women, on their own, seperately, can realize or believe in, b/c that would mean that there is something that women are reacting to and getting angry about, but that it's a religion we're indoctrinated into, that beliefs can't be coincidental b/c that would mean that ppl are realizing the same things individually, but that we're taught them and mindlessly obey without individual thought. It reduces feminists from individual women to a collection of mouthpieces for Big Sister and makes us easier to dismiss. I never watched Mary Poppins from beginning to end :O NOW I MUST!!! I have tried to understand generalizations for a long time, but I still don't understand why in this type of discussion some of the generalizations are bad (All comic book fans are living in their mother's basement and have poor body hygene) while the ones about women are all fine and dandy. And yes, Mary Poppins is worth re-watching, isn't it? I've never understood the whole "hive mind" myth. Just today I was talking with my best friend about how I loved I dream of Jeannie, while she hated it because she found it boring, and then she wondered why I liked it if I had found the MJ statuette demeaning. Different women, different opinions. How hard is that to understand? And yes, watch Mary Poppins from beginning to end. 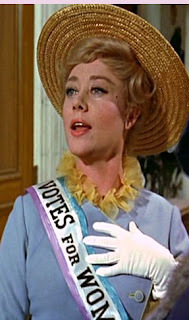 Mrs. Banks and her maids are a thing of wonder, even if they're played a bit for laughs, it doesn't change the message.